Seven years have gone by since completing my BFA, and four since my masters in design. I have seen countless friends’ careers flounder as they wandered aimlessly after leaving art school. While I was lucky to be employed in higher education almost from graduation day, most of my classmates ended up in careers far flung from the expertise listed in their degrees. Some have been successful in spite of it all, some not. Either way, I can’t help but think a better understanding of the professional art world would have made for a far more deliberate trajectory in their lives (and mine). 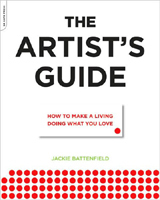 Jackie Battenfield’s The Artist’s Guide: How to Make a Living Doing What You Love, is like a Rosetta Stone that unlocks the mysteries of a complex business, bringing a desperately needed level of control to a burgeoning artist over his own future. It would be hard to imagine a more logical layout to a self-help book. Instead of starting with an inspirational moment, Battenfield begins by explaining exactly why an artist needs the information in this book, and then backs up the claim with a summary of how she gained this knowledge. In fact every assertion she makes about the art community and every strategy she recommends is supported with examples from her life, and the lives of numerous working artists. These anecdotes create an excellent balance to Battenfield’s confident, and sometimes commanding tone. Particularly so when she illustrates the importance of assessing and planning for the future, which, as asserted by Battenfield herself, is not to be skipped. She goes on to describe in amazing detail what you might need to manage your own work while supporting yourself; the importance of making connections, how to keep up these relationships and make them work for you. The perspective this book gives on how to design your daily life for efficiency and business success is as important as what is revealed about the nuts and bolts about the art world. I was especially surprised at how these strategies could have been applied to my life, since I am a more "corporate" designer rather than a "showing" fine artist. In fact, I was skeptical when starting this book that it would apply to my life at all. But the strategic side of it made me rethink so much about the way I do business and look at my future I was actually thankful to have read it. I have since recommended this to my own illustration students and will continue to suggest it to every younger artist I know, as well as my colleagues that teach them. The Artist’s Guide: How to make a living doing what you love is published by Da Capo Press. For more information and reviews, click the link above the article.